Mahshad is a director, producer, researcher and scriptwriter with over five years of experience in TV production and on-air programmes. 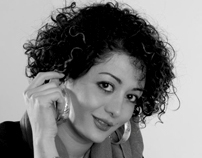 She has produced and directed over 50 episodes for TV series Cinema7 with Irane Farda Television from concept and development through to final production and delivery. During her time at the London Film School she directed and produced over 16 short films. A human & women’s right activist and campaigner Mahshad has previously raised 50,000 signatures in a recent petition within one month and was a guest speaker at Amnesty International. Her debut feature film Cul-de-sac has been selected and screened by 24 film festivals across the globe.